Emotional eaters use food to modulate their emotions whether it’s to promote positive emotions or suppress unpleasant ones. As an emotional eater, you may experience some guilt after overeating and you may also choose to have more food to alleviate that guilt. This is not always the case but a common scenario is this: you feel something and though you may not know what that feeling is, you know that you must eat. You eat food out of an urge, not physical hunger. Soon, you feel bad about what you did. You may then decide to eat some more to suppress that bad feeling. No matter what you do, if you eat food to regulate your feelings, your greatest asset is your honesty and your willingness to welcome your emotions and listen. 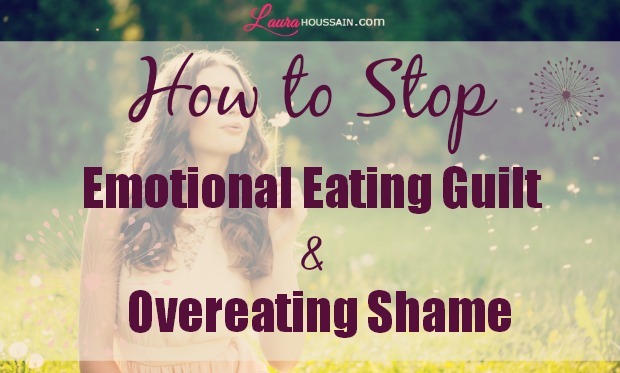 I have already written about what emotional eating is and how to stop it. I’m not going to repeat everything here. If you’ve just had an emotional binge eating episode and you’re feeling miserably guilty about it, just stop the negative self-talk and start giving yourself love immediately. In this situation, guilt is not going to help you gain power over food. It’s just going to make you feel worse. Empathy, curiosity and the willingness to listen to yourself are the way out of a binge. After a binge, pause and listen. Ask yourself what it is you’re really feeling and what you really need right now. I often hear women beat themselves up, calling themselves bad names and making a promise never to do it again. This doesn’t seem to work very well. Welcome that feeling of guilt and just say “no thank you”. “I did the best I could with the knowledge I had. I can make a different choice right now.” Your guilt is telling you that you haven’t met your own expectations, but unlike shame, which is saying “I’m bad to the core no matter what I do”, guilt can be alleviated by taking action… So don’t say “next time I’ll do better” and hope that it’s going to happen magically, take action right now. Put your hand on your heart. Take three deep breaths. Close your eyes and welcome the feelings you have tried to suppress. The first one may be guilt. Let it surface as if it is not your own, and ask yourself “Can I let it go”, then “Would I let it go” and then “When?” I’ve borrowed these questions from the Sedona method. You can Google it for further information. I combine it with several other techniques to help my clients release overwhelming feelings quickly. Once you feel calmer, ask yourself “what is it you really needed?” If you hear “food”, challenge that thought and listen with honesty. Once you know what it is you want, take action. Whatever you needed to do or express, do it now. If that is not possible right at this moment, do the closest thing you can do, and note on your calendar when you will do it – and set up an alarm. This may sound simplistic, but if you train yourself to handle relapses in this way, you’ll teach your unconscious mind that you know how to take care of yourself without food. You’ll also be better prepared to stop any cravings next time and avoid overeating guilt altogether because you will no longer eat because of your emotions. But what if guilt is a feeling that haunts you day and night? I have shown you how to recover from an overeating relapse without giving in to guilt. But what if you have a tendency to feel guilty all the time? You may feel guilty about not being good enough, not behaving well enough or just guilty for no apparent reason. In this situation, guilt has become a feeling you just always come back to. You may apologize for or feel bad about things you’re not responsible for, or maybe you have a zero mistake tolerance policy towards yourself. Usually, chronic guilt is an expression of shame. Once you have done everything you could do, you’ should be able to let go of the guilt. But what if no matter how hard you try to do it, you still feel guilty? Like I’ve explained above, guilt for no reason is shame. It’s a feeling of being bad to the core. A feeling that you don’t deserve much because there is something wrong with you, though you don’t know what or why? Shame is a distorted perception of reality. The only way to tackle it is to acknowledge your intrinsic value. I used to feel unworthy of success, love and pretty much any form of satisfaction in my life. Food was meager compensation for all the things I didn’t allow myself in life. I had created a story in my head that I was responsible for my parents’ happiness and that as they looked quite unhappy and their marriage had failed, I was a failure. I then walked the earth bearing that guilty cross on my back. If you suffer from chronic guilt, I really feel for you. I would need a whole program to show you how to release yourself from feelings of shame, but I can tell you this right now. 2/ Accept that shame has ruled your life and was based on false assumptions. For example in my own case, since when were kids responsible for their parents’ happiness and successful marriage? 5/ Break unsustainable promises to others. Like I promise to make you happy. You cannot make anyone really happy in the long-term. Everyone is responsible for their own happiness. This plan is the same one I have used to get out of mild depression, shame and low self-esteem. It will help you break free from all three, including emotional eating. I hope this article has helped you understand how easy it can be to break free from guilt in any situation once you know how. Taking control of your cravings is one of the most empowering experience. Giving up dieting is a huge first step. but if you want to take it one step further, I invite you to get my two favorite craving buster techniques by entering your name and email in the form below. They work wonders, and they’ll always be with you when you need them. Once you have controlled your cravings, you’ll never have to deal with another episode of eating disorder guilt. Please pass on your two favorite craving busting techniques. You’ll get access to full training to the first one I absolutely love if you signup at the top of this page. Thank you Mahima. I’m glad you liked it.